I know that during the holidays a lot of us bake cookies, and cookie bars, fudge and pies and all that yummy goodness, so I thought it would be a neat idea to have the 12 Days of Baking. 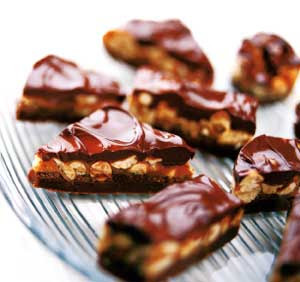 Today's recipe is for Easy Candy-Bar Treats!!! 1. Line a 9x9x2-inch or 11x7x11/2-inch baking pan with foil, extending the foil over edges of pan. Butter the foil; set pan aside. 2. In a large microwave-safe bowl microwave the butter, uncovered, on 100 percent power (high) for 1 to 1-1/2 minutes or until melted. Stir in cocoa powder, brown sugar, and milk. Microwave, uncovered, on high for 1 to 2 minutes or until mixture comes to a boil, stirring once. Stir again; microwave for 30 seconds more. Stir in powdered sugar and vanilla until smooth. Spread in prepared pan. 3. In a medium microwave-safe bowl combine caramels and water. Microwave, uncovered, on 50 percent power (medium) for 2-1/2 to 3 minutes or until caramels are melted, stirring once. Stir in peanuts. Microwave, uncovered, on medium for 45 to 60 seconds more or until mixture is softened. Gently and quickly spread peanut mixture over fudge layer in pan. 4. 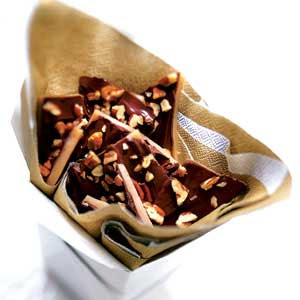 In a 2-cup microwave-safe glass measure combine semisweet and milk chocolate pieces. Microwave, uncovered, on 50 percent power (medium) for 2 to 3 minutes or until melted, stirring once or twice. Spread over peanut layer. Score into pieces while warm. Cover and chill for 2 to 3 hours or until bottom is firm. Use foil to lift candy out of pan. Cut into pieces. Store tightly covered in the refrigerator for up to 3 weeks. Makes about 2-3/4 pounds (64 pieces). Stove-top directions: In a medium saucepan melt butter over medium heat. Stir in cocoa powder, brown sugar, and milk. Bring to boiling. Remove from heat; stir in powdered sugar and vanilla. Spread in prepared pan. In another saucepan melt caramels with water over low heat; stir in peanuts. Gently and quickly spread over fudge layer in pan. In a small saucepan melt semisweet and milk chocolate pieces over low heat, stirring constantly. Spread over peanut layer. Continue as directed. Today I'm going for pies...who doesn't like pie huh??? 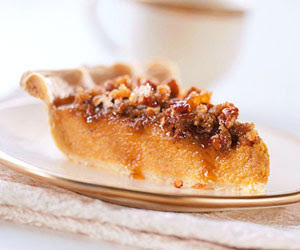 Caramel, pecans and pumpkin all in one pie...YUMMY!!! 1. Prepare and roll out pastry. Line a 9-inch pie plate with pastry. Trim; crimp edge as desired. In a large bowl stir together eggs, pumpkin, and half-and-half or milk. Stir in the granulated sugar, flour, lemon peel, vanilla, salt, cinnamon, nutmeg, and allspice. Pour pumpkin mixture into pastry-lined pie plate. Cover the edge of the pie with foil to prevent overbrowning. Bake in a 375 degree F oven for 25 minutes. 2. Meanwhile, in a medium bowl stir together the brown sugar, pecans, and butter until combined. Remove foil. Sprinkle brown sugar mixture over top of pie. Bake for 20 minutes more or until a knife inserted near the center comes out clean and topping is golden and bubbly. Cool on a wire rack. Cover and refrigerate within 2 hours. For today's recipe I picked some Toffee.....mmmmmm yummy. Line a 13x9x2-inch baking pan with foil, extending foil over edges of pan. Sprinkle the 1/2 cup coarsely chopped nuts in pan. Set pan aside. Butter sides of a heavy 2-quart saucepan. In saucepan melt butter. Add sugar, water, and corn syrup. Cook and stir over medium-high heat until mixture boils. Clip a candy thermometer to side of pan. Reduce heat to medium; continue boiling at a moderate, steady rate, stirring frequently, till thermometer registers 290 degree F, soft-crack stage (about 15 minutes). Watch care-fully after 280 degree F to prevent scorching. Remove saucepan from heat; remove thermometer. Pour candy into the prepared pan. Let candy stand about 5 minutes or till firm; sprinkle with chocolate. Let stand 1 to 2 minutes. When chocolate has softened, spread over candy. Sprinkle with the 1/2 cup finely chopped nuts. Chill until firm. When candy is firm, use foil to lift it out of pan; break into pieces. Store tightly covered. Makes about 1-1/2 pounds (48 servings). Who doesn't like cake?!?!?! WE all love a big slice of yummy cake don't we??? Especially during the holidays, I always have some cake at the house and I thought this one was a perfect one to share with you all. How does White chocolate sound??? You up for it??? 1. For frosting, in a medium saucepan combine whipping cream and chocolate. Cook, stirring occasionally, over low heat until chocolate is completely melted and smooth. Transfer to a large mixing bowl; cover and refrigerate until completely chilled, at least 2 hours. 2. Meanwhile, grease and flour two 9x1-1/2-inch or 8x1-1/2-inch round cake pans; set aside. Prepare cake mix according to package directions using egg whites. Spoon about 1-1/2 cups of batter into each cake pan. Sift cocoa over batter remaining in bowl; stir until blended. Spoon on cake mix in pans; swirl gently to marble and to spread batter evenly. Bake according to package directions except check cakes several minutes before minimum time indicated on package. * Let cakes cool on wire rack for 10 minutes. Remove cakes from pans; cool completely on wire racks. 3. Add cream cheese to chilled white chocolate mixture; beat with an electric mixer until smooth. Gradually add powdered sugar, beating until sugar is completely combined. (Mixture should hold soft peaks; do not overbeat.) Use immediately. 4. Place one cake layer on a serving platter. Frost with about 3�4 cup frosting. Top with second cake layer. Frost top and sides of cake. 5. Serve immediately or cover and chill until serving time (up to 4 hours). 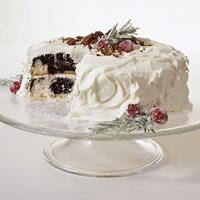 To serve, garnish cake with Sugared Rosemary and Cranberries and crushed biscotti, if desired. Makes 12 servings. Sugared Rosemary and Cranberries: Lightly spray several rosemary sprigs and cranberries with nonstick cooking spray. Sprinkle granulated sugar on rosemary; roll cranberries in a small amount of granulated sugar to coat. Place on waxed paper for at least 1 hour before using. This is a decorative, not edible, garnish. NOTE: The added cocoa makes the cakes bake in a shorter time. 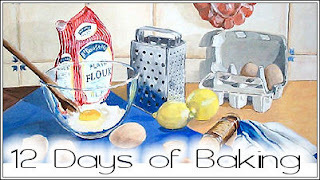 Starting today, I'm going to post a baking recipe everyday, for the next 12 days until Christmas. How does that sound??? I know that during the holidays a lot of us bake cookies, and cookie bars, fudge and pies and all that yummy goodness, so I thought it would be a neat idea to have the 12 Days of Baking. 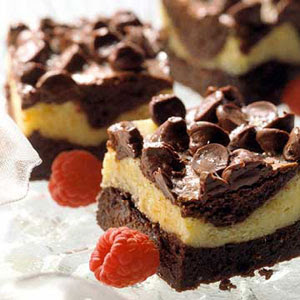 If you like Brownies as much as I do, then this recipe is definitely a MUST TRY, they are so good! 1. In a saucepan, melt the unsweetened chocolate and butter over low heat. Remove the mixture from the heat.Stir in 1-1/3 cups of the sugar and the 1/2 teaspoon vanilla. Cool the mixture for 15 minutes. Beat in the 3 eggs and the 3/4 cup flour. 2. In a mixing bowl, mix the remaining 1/3 cup sugar, the cream cheese, the 1 egg, the 4 teaspoons flour, and the 1/4 teaspoon vanilla. 3. Coat an 8x8x2-inch baking pan with nonstick cooking spray. Spread 2/3 of the chocolate batter in the pan. Spoon cream cheese layer over batter. Dollop with remaining chocolate batter. 4. Bake in a 350 degree F oven for 20 minutes. Sprinkle with chocolate pieces. Bake for 12 minutes more. Cool. Cover; store in the refrigerator. Let the chilled dessert stand at room temperature for 30 minutes to serve. Makes 16 servings.